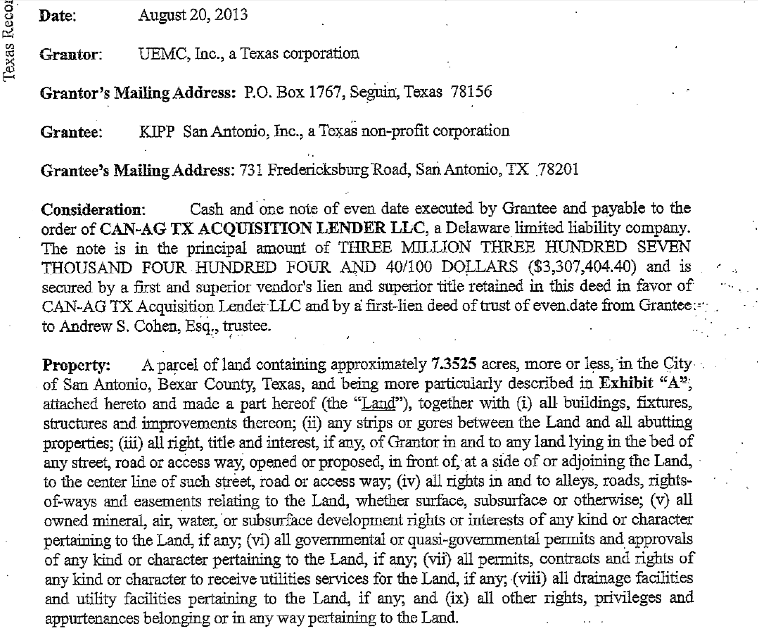 In 2013 KIPP San Antonio bought a former sewing factory that was located on a solid waste disposal site as the venue for its next San Antonio corporate reform school. KIPP paid the company that owned the toxic site over $3 million in money that was funneled through a holding company in Delaware. Below are two pages from the agreement. 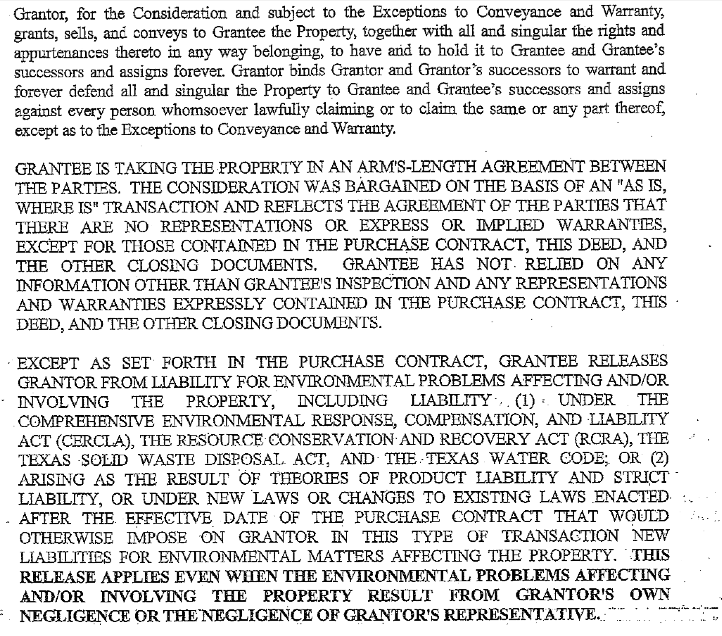 Noteworthy is the bolded language on the second page, which releases the seller from liabilities for all varieties of environmental problems affecting the property. We may guess this was not talked about with poor parents sending their kids for exposure to who knows what, notwithstanding the 2 feet of clay used as a barrier between toxic building waste and KIPPsters. KIPP never bothered to tell potential parents of this issue, and now the community is rightfully concerned as KIPP attempts to explain why it would 1) spend $3 million for a toxic site, and 2) never tell potential parents about it. SAN ANTONIO - Parents, grandparents and guardians of children who will attend KIPP San Antonio’s newest school this year attended a public meeting Monday to get their questions answered about health and safety concerns regarding the location of the school. At 4343 West Commerce, the school was built on top of an old landfill that was used to dump construction materials, according to KIPP, and was covered in 1959. 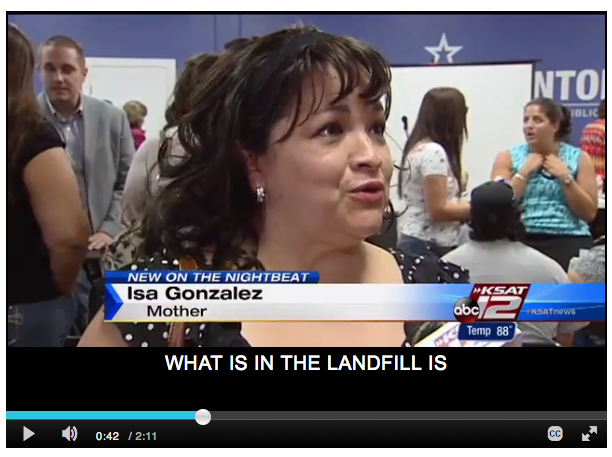 “What was in the landfill was metal, glass, concrete,” said KIPP San Antonio CEO, Mark Larson. “Its a matter of physical protection for our child and whether they would be in a safe environment daily,” said Isa Gonzalez, whose child will attend the new KIPP school during his senior year. Larson says KIPP purchased the property last May and conducted thorough environmental testing prior to the purchase that showed no danger. Those monitors are used to detect methane and function similar to smoke detectors, Larson added. In a true layman’s comparison, Larson shared with those attending the meeting that human flatulence emits more methane than was detected in recent testing at the site. Some parents in attendance were troubled that they weren’t given more notice regarding the environmental issue, especially since the school is set to open Aug. 11. “We've been notified by mail about many things and I wished that they had notified parents in that manner given that most parents don’t speak English or have access to computers in their home,” said mother Vedette Padilla. Officials with the Texas Commission on Environmental Quality were on hand at Monday’s meeting at KIPP Headquarters at 731 Fredericksburg Road to answer questions and explain the permit process KIPP must go through in order to operate the school. Larson expects KIPP will be granted the Municipal Solid Waste Development Permit. Monday was the last chance for public comment on the environmental concerns and the TCEQ must make the decision whether to grant KIPP the permit within five days. The new KIPP school is a permanent location for the prep school and will be home to K-2 and fifth to 12th grades. Makes complete sense. KIPP treats their staff and students like garbage every day.